Today at Nagato sensei’s class, we did some variations around Teiken (蹄拳) from a rear body hug and Musan (霧散) from Shinden Fudō Ryū. After reviewing the basic forms from the Densho, Nagato sensei did many applications around the initial form. He was de-structuring the original movement to adapt it to different types of situations. In fact, it was obvious to me that each waza is destined to become a world of possibilities. I saw here today the exact same “Ri” demonstrated yesterday night by Noguchi sensei (see previous post). We did a lot of variations with the sword in the belt, and we added it to the movement. Sometimes the sword was unsheathed; sometimes it was not. Speaking of drawing the sword, he said that we had to “apply the techniques with the sword but in a natural manner. This is not Iaidō! 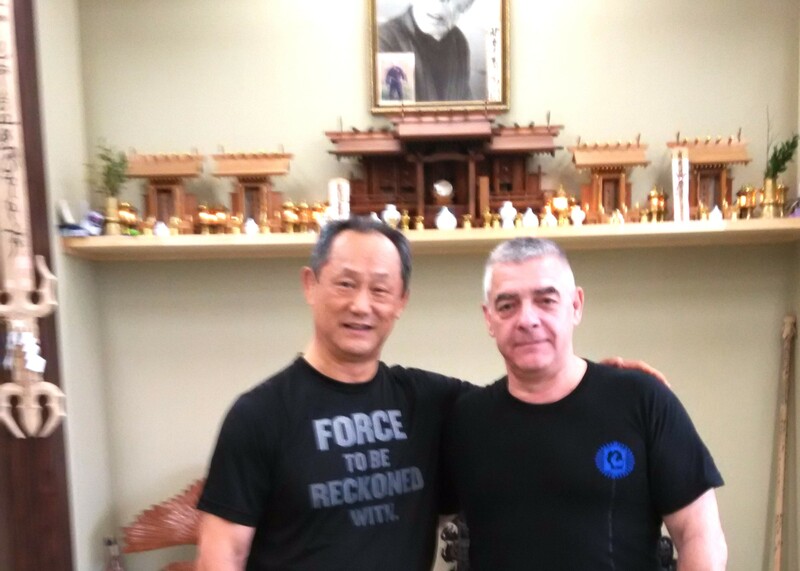 Iaidō has nothing to do with the Bujinkan”. He said that we must develop our sword movements through taijutsu. This is the quality of our Taijutsu that gives life to the blade, not the opposite. This is why it is not iaidō. He also explained that if we do not have a good taijutsu it is impossible to get the freedom necessary to use the sword in a real fight. I would add to that Iai kata are useful to develop the handling of the weapon, but they don’t teach you how to survive a fight. In a real fight, there is no “Uke” as both opponents are “Tori” by nature. What I liked is that, still speaking about the sword, he said that we have to “keep it secret”, referring to our personal style of moving the sword. It does make sense after all the warriors had to have a “competitive advantage” over their enemies if they wanted to survive. Making it logical then keep it secret. Secrecy is the foundation of warfare. It was overall, a very interesting class in may aspects. The central point Nagato sensei insisted on was that whatever the situation, we have to “be protected at all time”. By saying that his body was preventing any counter attack from Uke. Nagato sensei was controlling the arms of the attacker permanently by either grabbing or supporting them with his back. The first objective of training is self-protection. But added, that when you reach a high level, ” you sometimes have to let a side of the body unprotected so that you can channel uke’s movements”. When Uke is in the fight and sees an opening, he will more likely try to use it. You have to be so good that you let him believe that he can win. This is Kyojutsu (3). It is like in the attack of the village in the “7 Samurai” by Kurosawa (4). If you remember it, the farmers keep the door of the village open to let the enemy enter. But they close the gate after three or four are in. They kill them and open the door again to get a new batch of thieves. You have to do exactly that (if you have the level). And this is why Nagato sensei said “the sword can be used efficiently if and only if, you have a good Taijutsu”. Nagato sensei’s ended the class explaining that the techniques in a Ryūha are very simple. So please don’t make them complex. If you find them complicated, it is maybe that you don’t have the technical level (yet) to understand their simplicity.